An artist's rendition of one design that might be used for the Gordie Howe International Bridge. When the Gordie Howe International Bridge from Canada to the U.S. is complete, it’s expected that thousands of trucks a day will travel through the Detroit neighborhood of Delray. Residents there want the government to keep additional pollution to a minimum. Delray is already close to the Ambassador bridge. But when the Gordie Howe bridge opens, it’s projected about five thousand trucks a day will go right through the middle of the neighborhood. And that number is expected to increase each year. “That is a new source of emissions on top of the emissions that are already here, that we live with,” said Simone Sagovac with the Southwest Detroit Community Benefits Coalition. Simone Sagovac with Southwest Detroit Community Benefits on the phone with officials about the impacts of the Gordie Howe International Bridge on the Delray neighborhood in Detroit. “We already have really high asthma rates in southwest Detroit, especially along the freeways. And it doesn’t stop at asthma. People have heart conditions, mothers complain to us about their four children having hearing loss and asthma in the same family. So, the conditions are there,” Sagovac added. The neighbors are already worried. Natasha Dado reports for the Arab American News, which is a Detroit Journalism Cooperative partner. She talked with Patricia Ramirez-Gonzales. Her 15 year-old-son has asthma. Her daughter died of cancer in 2012. She was 28 years old. Ramirez-Gonzales remembers talking with the doctors. “And I asked them, ‘Why?’ My daughter was healthy. Why? They said the cancer was just something in the air,” Ramirez-Gonzales said, her voice cracking. There’s no way of definitively identifying air pollution as the cause. But Delray is surrounded by steel mills, an oil refinery, a coal-fired power plant, scrap yards, and the region's wastewater treatment plant with incinerators. I-75 borders the neighborhood. A series by the Detroit Free Press five years ago reported the zip code that includes Delray was the most polluted in Michigan. Ramirez-Gonzales says the idea of thousands of diesel trucks adds to the residents’ health worries. “I don’t deny that the bridge may bring more jobs and more opportunity and more people," she said, "but what about the people who are left here? I’m not saying just for the ones that are here still. I’m saying for the ones that are to grow up here." The State of Michigan has been assuring Delray neighbors everything is going to be okay. Mohammed Alghurabi is with the Michigan Department of Transportation. He’s the Project Manager for the bridge. “Our air quality analysis for the Gordie Howe International Bridge is predicted to be below the standards that are stated in the Clean Air Act,” he said. Alghurabi insists the state has been listening to the residents. He says any "reasonable and appropriate" way to reduce the impact of pollution from truck traffic will be presented to the Windsor Detroit Bridge Authority. The Authority will operate the bridge. Michigan is just one player among many making the decisions. Simone Sagovac says what the neighborhood wants is simple. “We’re looking at how we can reduce the impact of trucks. There are programs that have been successfully implemented to reduce diesel emissions at the source, at the truck," Sagovac said. Residents of the Delray neighborhood want wider buffer zones between bridge traffic and their homes. She says west coast ports have found solutions. The Port of Long Beach reduced some air pollutants by more than 90 percent by banning older, more polluting trucks. Sagovac says that could be done at the Gordie Howe bridge. She also wants larger buffer zones surrounding the area to help protect homes. The state knows of these requests. The question I asked the Michigan Department of Transportation's Alghurabi is whether Delray residents are going to be happy with what happens. “I mean, Lester, let’s just be honest. It’s very hard to strive for ‘happy.’ I think we believe that we can come up with solutions that everybody can live with,” Alghurabi responded. 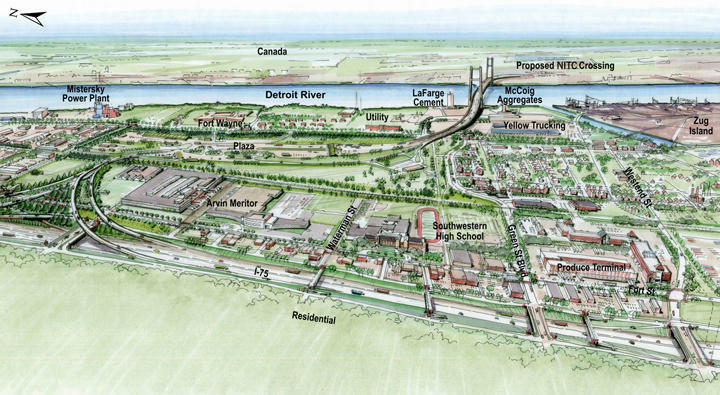 The state will be taking its final recommendations to the Windsor Detroit Bridge Authority sometime in December. The people living in Delray have until then to make their case. 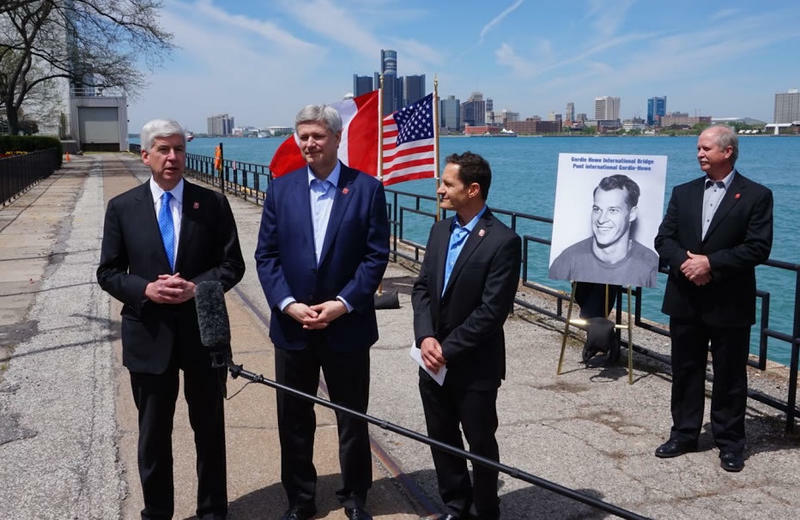 The publicly financed bridge between Detroit and Windsor will be called the Gordie Howe International Crossing. Gov. Rick Snyder and Canadian Prime Minister Stephen Harper made the announcement in Windsor today. It appears Canadian officials won't let a tight-fisted U.S. government stop progress on the New International Trade Crossing between Canada and the U.S.
Canada is footing most of the bill for building the crossing, including $550 million to help pay for access road construction on Michigan's side.